When the massive march kicked off at Waterfront Park last Saturday, the procession was led by women from SEIU-USWW, the union that represents janitors, security officers, airport service workers and other property service workers. With the apparent defeat of a measure backed by termed-out National City Mayor Ron Morrison to replace existing term limits with new ones, it appears the mayor’s time in office is up — at least for now. Union workers and volunteers gathered early Saturday morning, December 15 for the 31st San Diego and Imperial Counties Labor Council Food & Toy Distribution (SDICLC). The purpose for union workers in organizing annual fundraisers is to assist fellow working families and community members in need, organizers said. We celebrate Labor Day to honor the sacrifices of workers past — whose bravery has led to the creation of the American middle class. These workers fought for and won the first minimum wage, an eight hour workday, life-saving health and safety regulations and protections against workplace discrimination. These workers were members of a union. 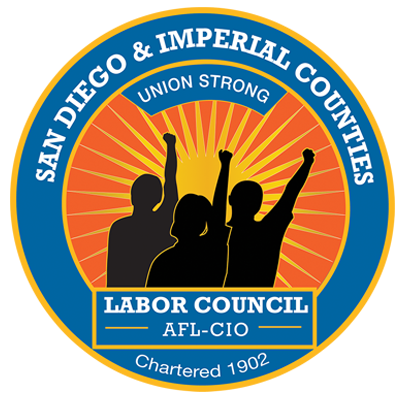 Last year, the national AFL-CIO took over its local affiliate, the San Diego-Imperial Counties Labor Council. It sent one of its employees, Keith Maddox, in to run it as a trustee. Now, Maddox has agreed to stick around. He’s developed a reputation of working well with both his union counterparts and the business community. He’s gotten some credit for pulling together the coalition pushing the measure to expand the Convention Center and fund homeless services with an increase to the hotel room tax in the city of San Diego. Keith Maddox, trustee of the San Diego & Imperial Counties Labor Council, said the compromise he helped broker was noteworthy, but that new city policies are needed. "We negotiated the best deal that is possible for these residents in a really bad situation," he said. “But this is just one example of what happens every single day in the city of San Diego because of inefficient housing policies."